Who would buy a football club in these trying times? 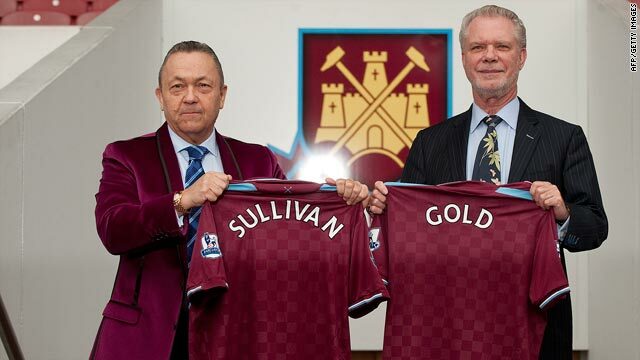 David Sullivan, left, and David Gold have bought a controlling stake in cash-strapped English club West Ham. (CNN) -- With Portsmouth failing to avert an upcoming court appearance over millions in unpaid taxes, and West Ham's new owners claiming their acquisition made "no commercial sense," the plight of the two English clubs highlights the dire economic times that world football faces. Portsmouth must appear at a winding-up hearing on February 10 unless the struggling Premier League outfit win an appeal after failing to convince a judge that the British tax department's valuation of their bill is $12 million too high. West Ham's new owners David Gold and David Sullivan, who sold Premier League rivals Birmingham to Hong Kong businessman Carson Yeung in October, revealed that the club have debts of more than $160 million. West Ham's problems stem from the ill-fated takeover in late 2006 by an Icelandic group, whose main backers were hit hard by their country's economic meltdown in 2008. "We would not buy this club at all if this wasn't West Ham. It makes no commercial sense for anyone to buy this club, and it's amazing that two other people wanted to buy it," Sullivan said. "One is another West Ham supporter [Tony Fernandes] and the Italian [Massimo Cellino] -- I am not quite sure if he looked at the books properly, but if he looked at the books he might have walked away. "We bought this as supporters, not from a business point of view. We will raise more money and, with other people, will dig the club out of the mess it is in." Portsmouth have been in financial freefall since former owner Alexandre Gaydamak sold the club to Dubai businessman Sulaiman Al Fahim, who had fronted the Abu Dhabi consortium that bought out Manchester City a year previously. Al Fahim's protracted takeover saw many of the south-coast club's top players leave in order to balance the books, and he in turn sold a controlling stake to Saudi investor Ali Al-Faraj in late August. That has failed to help, with the players' wages not being paid on time four times this season, and Portsmouth are trying to overturn a transfer embargo and the diversion of their television revenue to clubs that are owed fees for past player purchases. Added to that, Gaydamak claims that he is still owed some $45 million in loans. But such problems are also facing clubs at the other end of the scale. Manchester United, regularly near the top of Deloitte's wealthy list, have confirmed plans to raise $813 million through a bond issue to help refinance their debts as the reality of the current economic climate continues to hit the game. United have since announced pre-tax profits of $78.4 million for the year to 30 June 2009, compared with a loss of $34.8 million a year ago, but without the sale of Cristiano Ronaldo, the Red Devils would have reported a loss of $51.7 million despite a trophy-laden season. Chelsea's billionaire owner Roman Abramovich responded by converting the $540 million he has given the English club in interest-free loans into equity. Sheikh Mansour has invested a staggering $630 million since buying the heavily indebted club in August 2008, the figures released by the club revealed.